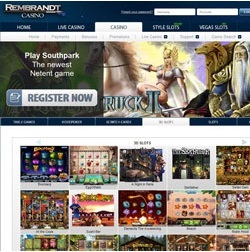 Rembrandt Casino is set on offering its clients the best titles out there, which is why it collected the most entertaining games from four of the biggest gambling software developers: NetEnt, Microgaming, Play’n GO, Betsoft and Genii. Now you can find the most popular titles, as well as excellent live casino games, all in one place. All of these are available via instant play, which means you can play in your browser, without having to download and install additional software. The Casino section of the website offers a selection of online Blackjack variants, including classic, single deck, double exposure Blackjack, as well as high and low limit games. Another option for fans of the game is the Live casino, where players can join several tables with bets ranging from EUR 5 to as much as EUR 5,000. Rembrandt Casino offers a selection of games wide enough to meet a gambler’s highest expectations. Whether you’re into slots, roulette, baccarat, pontoon, blackjack, scratch cards or video poker, this website has it all. If you prefer live dealer games, just go to the Live Casino and pick your favorite game: roulette, blackjack, baccarat or casino hold’em. 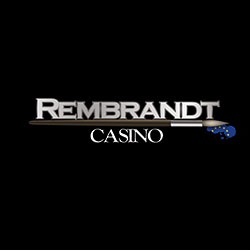 While the impressive selection of games available at Rembrandt Casino is reason enough to visit the website, their wonderful bonuses and promotions are what will make you stick around. As soon as you sign up and make your first deposit, you instantly get an amazing 100% welcome bonus up to EUR 200 as a reward. But that’s not all. There are more deposit and reload bonuses up for grabs (3 more reloads which will make up for EUR 1700 + 250 Free Spins, in the end), and regular promotions await you every week. New games come with personalized promotions (Take Away Tuesday, New Games bonus, VIP Club, Deposit bonuses) and loyalty pays off, as frequent players get to enjoy unique offers. The owners of this online casino have certainly gone out of their way to make it as appealing as possible. Online and mobile casino gamblers are welcome to explore the rich selection of games and promotions available to both new and old players. 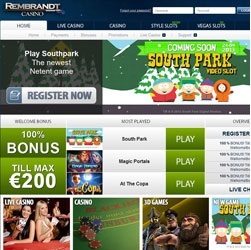 The cool bonuses offered by Rembrandt Casino will make your visit 100% worth it. Whether you’re looking to have some fun playing slots or test your blackjack skills at the live casino, this online casino truly has it all.